Stereotyping is not always a good thing. But so often it seems so accurate. And sometimes it’s funny … as long as you’re not the one being stereotyped, maybe. Well, I’ve got a little stereotyping going through my head. Seems to me that if you’re White and from the South you consider yourself related to the most random people. It’s a strange thing, this difference in outlooks. But then families can be very strange, too. It’s been proven that every family tree produces some lemons, some nuts, and a few bad apples. I think you find those bad apples when someone in the family dies. They might have been sort of hidden in the basket until then … and then POP the stench comes out. Shew. Stay away from those folks because if someone treats their family poorly, they are likely to treat you that way, too. That’s just my opinion. I didn’t read that. But I’ve watched it a few times. “When there is darkness, dare to be the first to shine a light. “When there is injustice, dare to be the first to condemn it. “When something seems difficult, dare to do it anyway. “When life seems to beat you down, dare to fight back. “When you’re feeling tired, dare to keep going. “When times are tough, dare to be tougher. “When love hurts you, dare to love again. “When someone is hurting, dare to help them heal. “When another is lost, dare to help them find the way. “When a friend falls, dare to be the first to extend a hand. “When you cross paths with another, dare to make them smile. “When you feel great, dare to help someone else feel great too. “When the day has ended, dare to feel as you’ve done your best. Carnival for a Cure is Saturday, Sept. 13, at the Guymon High School in the afternoon. This is a location change, so note that. Lymphing for Lori is a memorial 5K run held on the same Saturday morning at 8 am, meeting at the Girl Scout Hut (north of the Texas County Activity Center). Friends of the Y Sip and fit is on Sept. 19. Pink Heals Poker Run is Sept. 20. 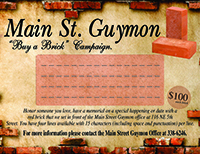 Guymon Fiesta is Sept. 21. There are a lot of fun things going on that you can take part in!